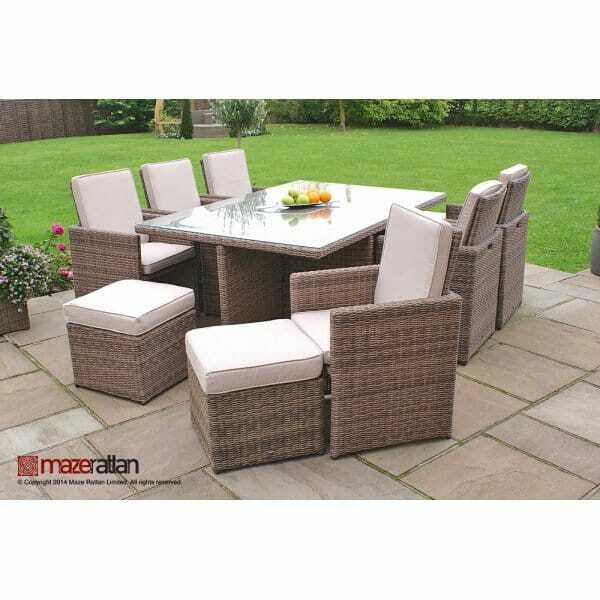 Maze Rattan Winchester 7pc Cube Set with Footstools: The Maze Rattan Winchester 7pc Cube Set with Footstools is a sleek and attractive outdoor dining set that is versatile to your space and your entertaining needs. The table measure an impressive 190cm wide and 125cm deep with allows plenty of space 6 to 10 people if using the footstools as extra seating. The armchairs are designed to fit snugly under the table by folding down the back, the footstools store under the chair so everything has a home in this rattan outdoor dining set. You'll find the synthetic rattan and the lightweight aluminium frame to be practical and requires little to no maintenance, the showerproof fabric on the cushions means you can leave the furniture outdoors for in dryer periods of weather. A very useful and beautiful furniture set that is flexible to your needs.